For those of you that don’t know, I have insanely curly hair. We are talking frizzy, dry and totally untamable hair. My entire life I have worn it in a pony tail, hair clip or something of the sort because it was just embarrassing to me. I do not like frizzy hair and no matter what I do…. there is frizz. I have tried just about everything. From products that are way too expensive to good old dollar store gel. Nothing seems to make it anything that I like. Straightening it takes at least an hour. Even then it is still frizzy. I was at a conference this past weekend in Atlanta and a friend of mine, and fellow blogger, Rose mentioned that she has been doing the Curly Girl Method for about a month now. I had seen her at BlogHer in August. Like me, she kept her hair pinned back during that conference. Well this time she had her hair down and it looked GREAT. Her secret? 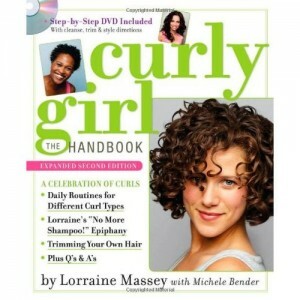 Curly Girl: The Handbook. After seeing the improvement of her hair I was totally convinced. My hair stylist had actually recommended that I check it out a couple months ago too. But I quickly forgot about it. The proof is in the results though! I haven’t started it yet, in fact I just ordered my book today. I thought it would be fun to do a regular blog and even get some of you participating too! You can order the book on Amazon (there is a kindle version available too!) or even just borrow it from your local library. I will be starting Monday, October 15. 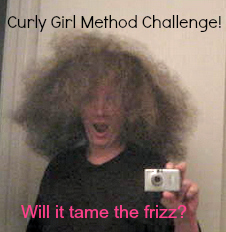 Anyone else up for the challenge to tame the frizz? My hair is curly but fine & thin… but it’s REALLY awesome. went CG 3 years ago and haven’t looked back 🙂 good luck! I have thick, curly, frizzy, coarse, hair and have been doing the curly girl method for the past 10months. It’s still a process but I have seen changes and am impressed! I have some posts on my blog about my hair. I’m in the process of working on another post about my hair too. Stop by and visit if you have a chance and say hi. Good luck with the curly girl method. I am even incorporating my two boys into the CGM because they both have curls.